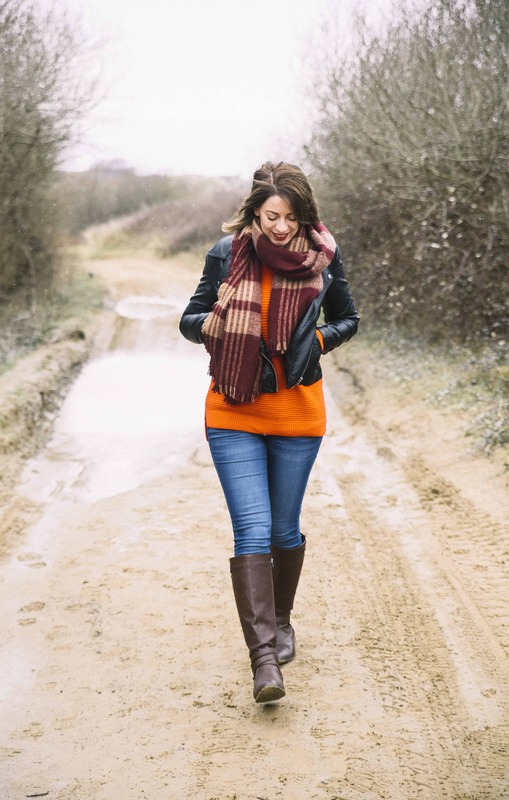 I think breakfast is my favourite meal of the day – and nothing is better than gluten and dairy free pancakes. Nothing, that is, except for topping those gluten and dairy free pancakes with caramelised bananas and a sticky, coconut caramel sauce. This, my friends, is the breakfast of champions. And while I don’t advocate sugary breakfasts every day of a week, this is a Sunday breakfast or brunch to be savoured. 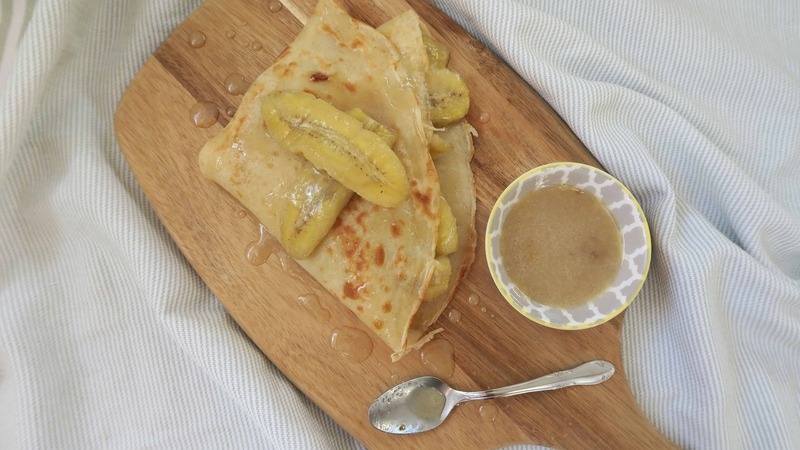 The whole cooking process is delicious in itself – what more fun of a morning than to whisk and flip your own pancakes, the caramel bubbling away as you do? It’s a simple pleasure, and one which I love. And while these do have a higher sugar content than my usual breakfast, they’re made with honey and bananas, so are refined sugar free. So when I saw a competition on Foodies100 to create a dairy free style breakfast with Vita Coco, I had to enter. 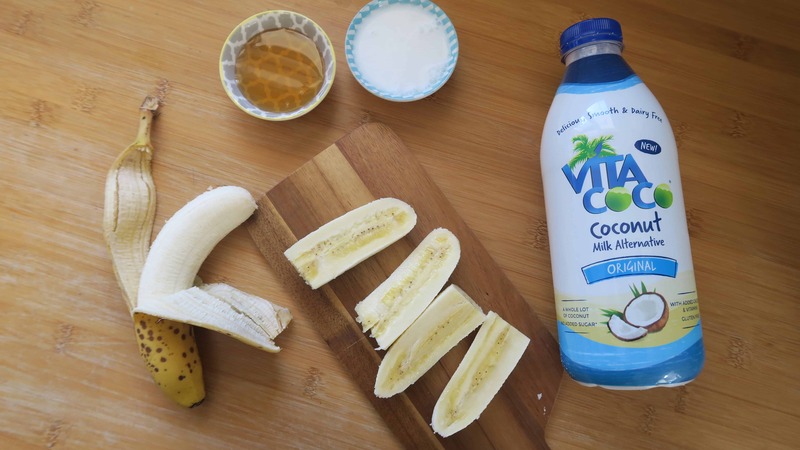 I love Vita Coco’s products – I regularly drink their coconut water and add it to smoothies, so I was excited to try this new, Vita Coco Coconut Milk Alternative. Unlike the cartoned coconut milk you can buy, this tastes really creamy and has a refreshing taste. I’d happily drink a glass of it on its own, but it worked perfectly in these gluten and dairy free pancakes. Now I’ll be honest, this isn’t the most beautiful recipe I’ve ever photographed – and believe me, we ate A LOT of these (on request by Steve, I might add, who LOVED them) so I could try a few different setups. But some recipes are just so damn amazing, you have to eat them to truly appreciate them. And I definitely urge you to make these, because you will be blown away. I can’t sing their praises enough. I’ve eaten about four portions of this in one weekend, and still love it. 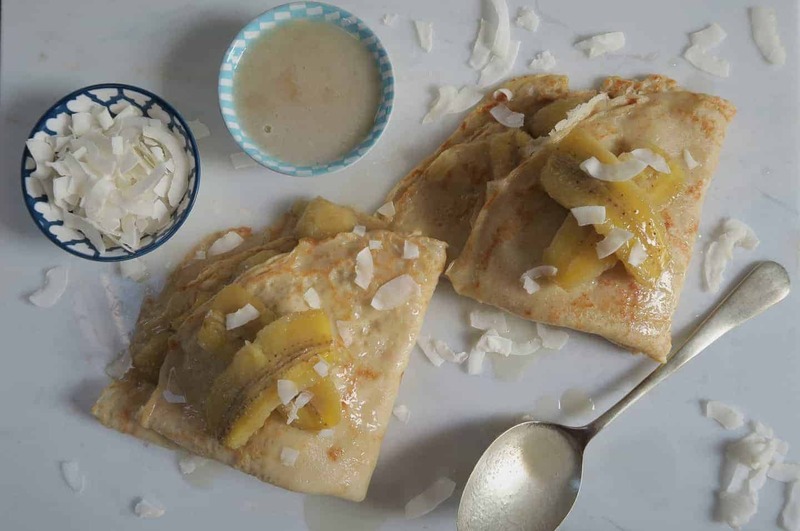 The gluten and dairy free pancakes are so simple – it’s a basic pancake (crêpe-style) recipe, just made with gluten free flour and the Vita Coco Coconut Milk Alternative. If you wanted to make these vegan, you could use an egg-replacer such as flax or chia seeds. 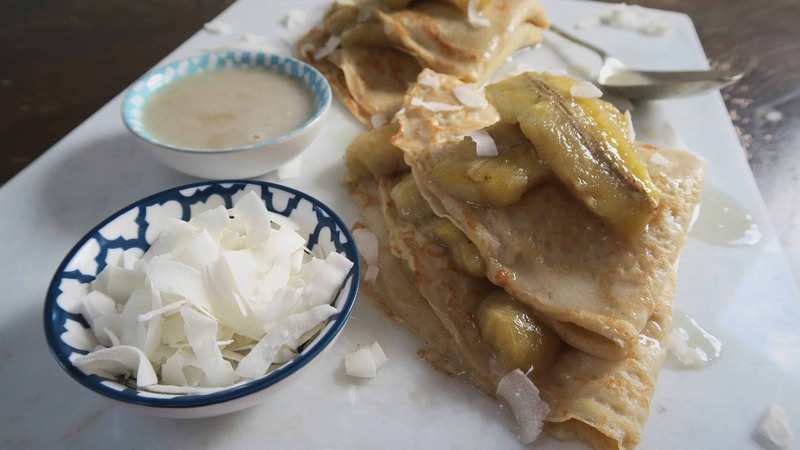 The coconut caramelised bananas are made separately, and then you combine the whole lot for a beautiful, sweet and delicious dish. Perfect for a late Sunday breakfast, paired with a cup of tea. 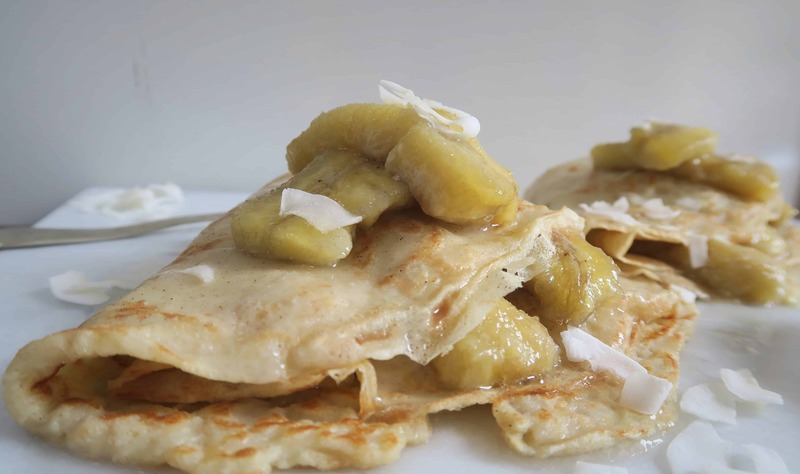 A delicious breakfast or brunch treat of gluten and dairy free pancakes with caramelised bananas in a coconut caramel. First make the pancakes. 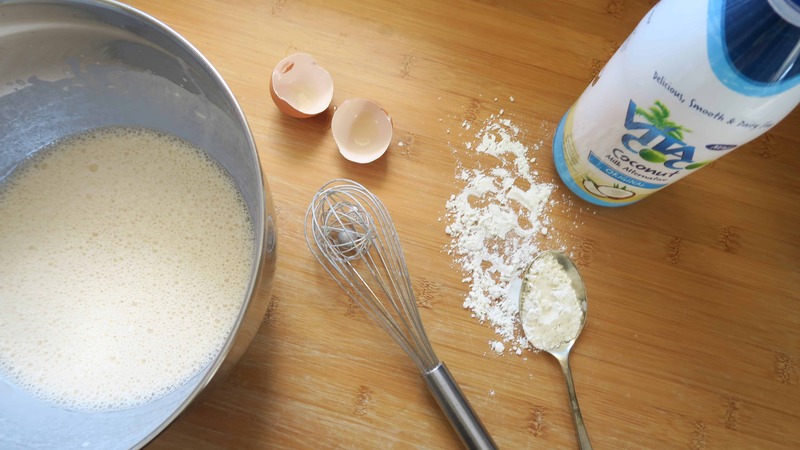 Add the flour, cinnamon, salt and egg, plus half of the Vita Coco coconut milk alternative to a large mixing bowl. Mix well to form a paste and when there are no lumps, add the rest of the coconut milk and whisk until smooth. Cover in cling film and place in the fridge for around 20 minutes. Meanwhile, cut the bananas in half, and then in half lengthways. 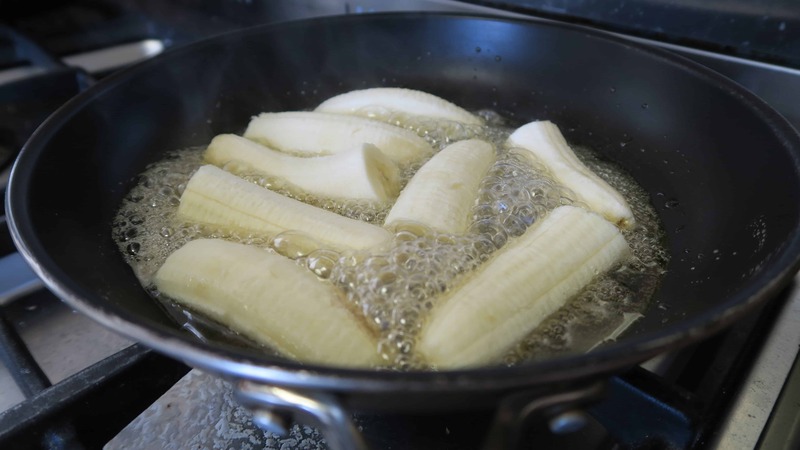 Heat the honey in a small frying pan, and when it begins to bubble add the bananas. Cook for 2-3 minutes on each side until caramelised, then remove from the pan. Be gentle as they can go soft and be quite delicate. Add the Vita Coco coconut milk alternative to the honey in the pan, stir, and allow to bubble. Leave bubbling for around 10 minutes, stirring occasionally to stop it sticking, while you make the pancakes. Bring the pancake mixture out of the fridge, mix well and then fry 1.5 ladles at a time in a large, non-stick pan with some coconut oil. You'll need about a minute on each side on a high heat, flipping half way. To keep your pancakes warm, place them in a very low oven on a plate between sheets of greaseproof paper until you are ready. Once the caramel mixture has started to thicken, turn off the heat and set aside to cool slightly while you finish the pancakes. Once the pancakes are cooked, place each one at a time on a plate. Place some bananas in a quarter and then fold the pancake in half, then in half again. Stack them on a plate and drizzle the sauce over the top. Then eat! Tip - some flaked coconut adds a lovely crunch if sprinkled on top. The BEST double chocolate cookie gluten free ice-cream sandwiches!